Explorers have maps, engineers and architects have blueprints, directors and actors follow scripts, but what do marketers, advertisers, artists, writers, creators, project managers use to have a smooth flow for their projects? Others may think that these professionals just eyeball what needs to be done and call it a day, but they are mistaken. It takes a village and an organized plan in order to have an effective marketing or advertising campaign. Speaking of which, everything that needs long-term execution and involves boat loads of cash needs thorough and careful planning. 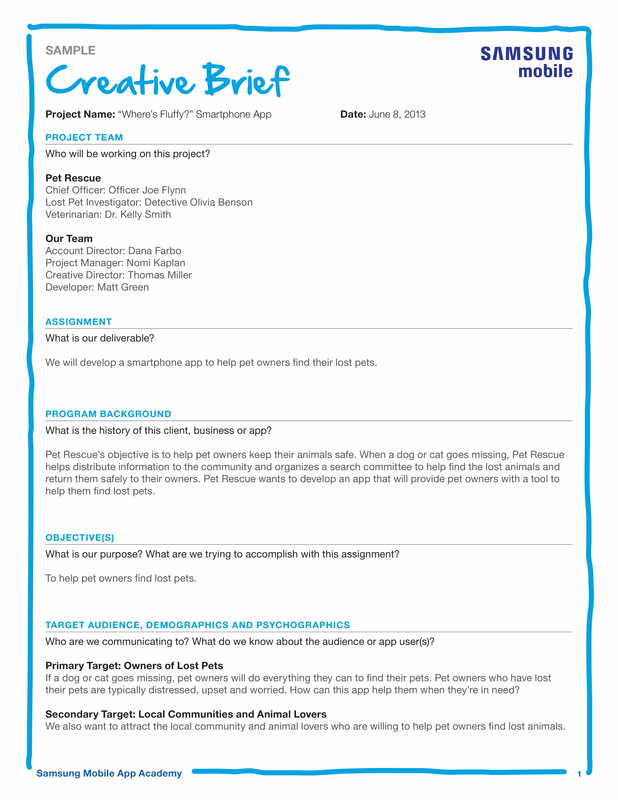 It is extremely wasteful of time, effort, money, and other resources to come up with ideas that have no consideration for the future; for example, your team has an idea on how to market or advertise your company but you have no plans on how to finish the project, what steps are necessary to take, what to do for its full implementation, and so on. This can only cause you and your team extreme stress and leaves a lot of room for mistakes that you cannot afford to do. Therefore, you need to be able to devise a concrete, complete, and comprehensive plan on what to do for your marketing and advertising campaigns. You have to establish a clear direction and a strong sense of purpose on what you want to achieve with the project. This will then help you efficiently and effectively implement the ideas and concepts that you have agreed upon. But what do you use to achieve this? How do you come up with the right solution to such a problem? The answer to your questions is a creative brief. 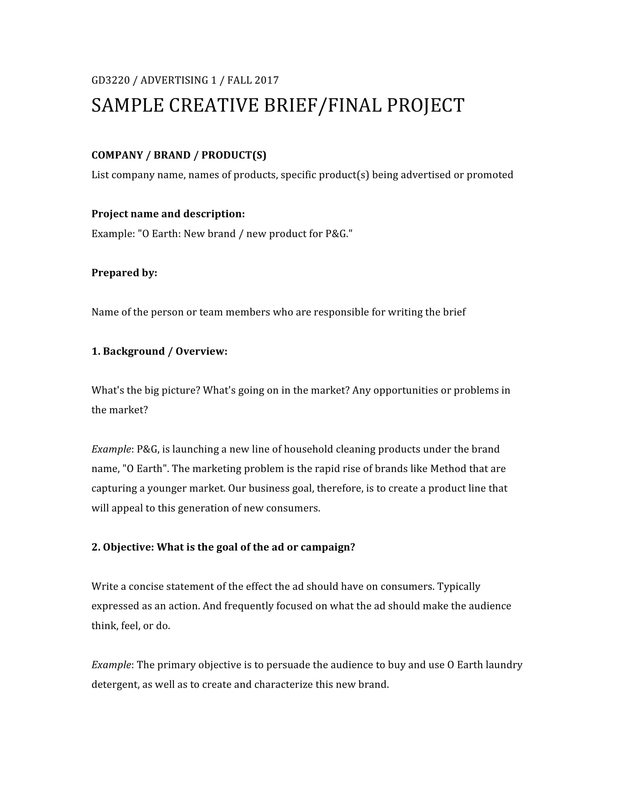 Before you go on and make a creative brief for your marketing and/or advertising campaigns, you need to be able to understand the basic concept behind a creative brief. 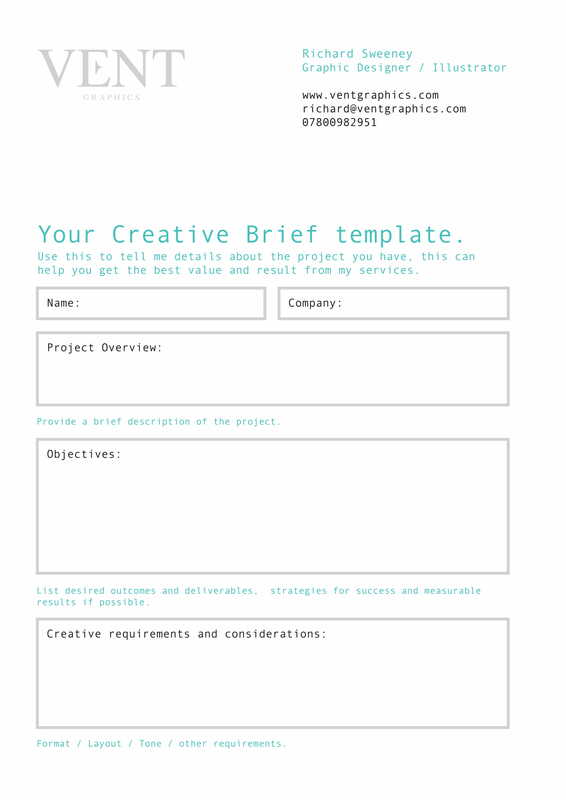 A creative brief is basically the equivalent of a blueprint for marketers, project managers, etc. 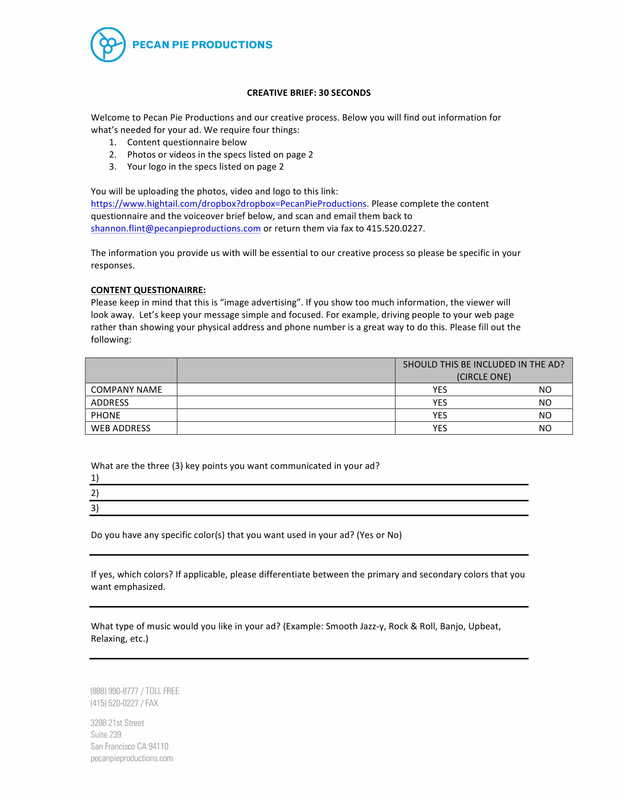 It is the outline of the creative project you are about to implement to help market your company and the products and/or services you offer to the general public, but more so to your target demographic. Simply put, it is the foundation for any advertising or marketing campaign. 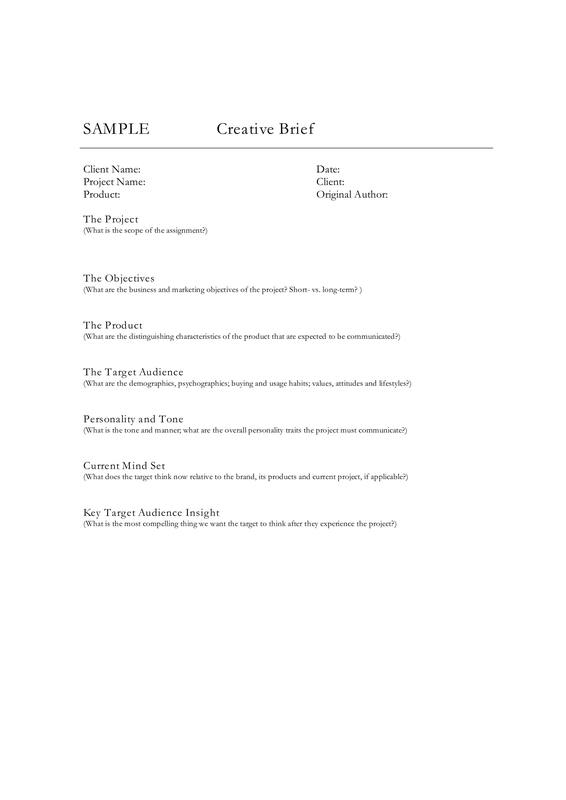 By definition, a creative brief is a “marketing a document that gives details of what should be considered when something is being designed or advertised: In any marketing campaign, a good creative brief will focus your efforts and sharpen your message.” It is a framework designed by the requesting party (the customer) to be followed by an advertising company in promoting the company and its products and/or services. It serves as a guide and even as a source of inspiration in order to produce quality promotional outputs. It contains a summary of the key factors needed for your final output. It dwells on the big picture down to the most specific details necessary to complete and effectively implement the plan. It contains a concise summary of the background, the target audience, information regarding the company or brand competitors, the client’s short- and long-term goals and other project specifics. These information will be used as the basis when your team generates ideas and concepts and basically a guide on how to fulfill such requirements. 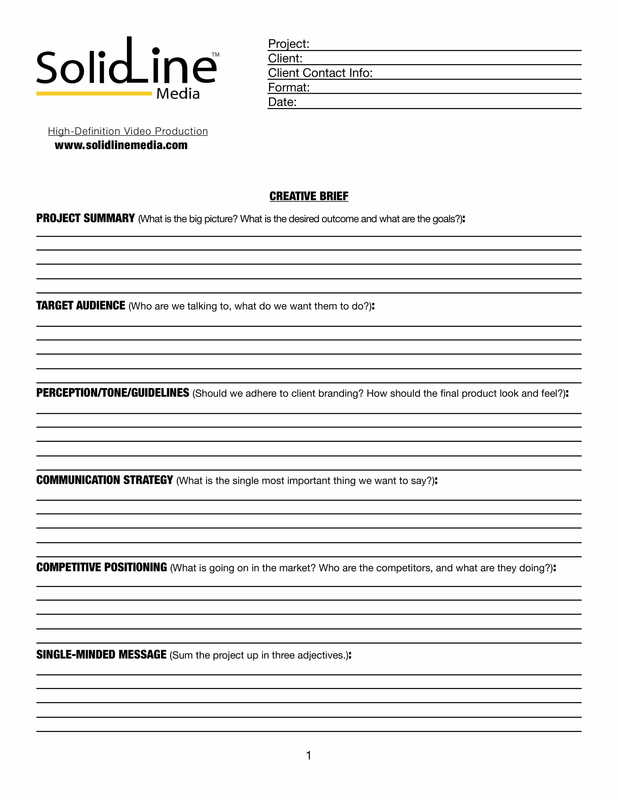 A creative brief should answer some of these questions: What is this project? What’s the task at hand? Why is there a need to do it? What is the true problem or opportunity here? Who is it really for and why should they care? Where, when, and how will it be used? How will it be remembered and retold? What needs to be done by whom, and when should it be delivered? The answers to these questions will help you and your whole team form and establish a good quality design for your marketing or advertising campaign. 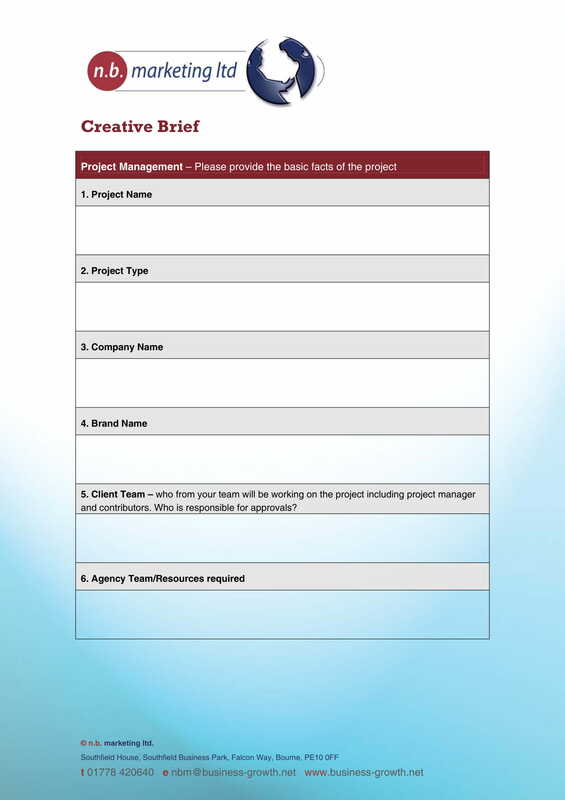 A creative brief is an efficient tool to use in order to get all project participants on board on the same boat. Regardless of your position, a creative brief will help you get everyone prepare and think of the same thing at the same time. 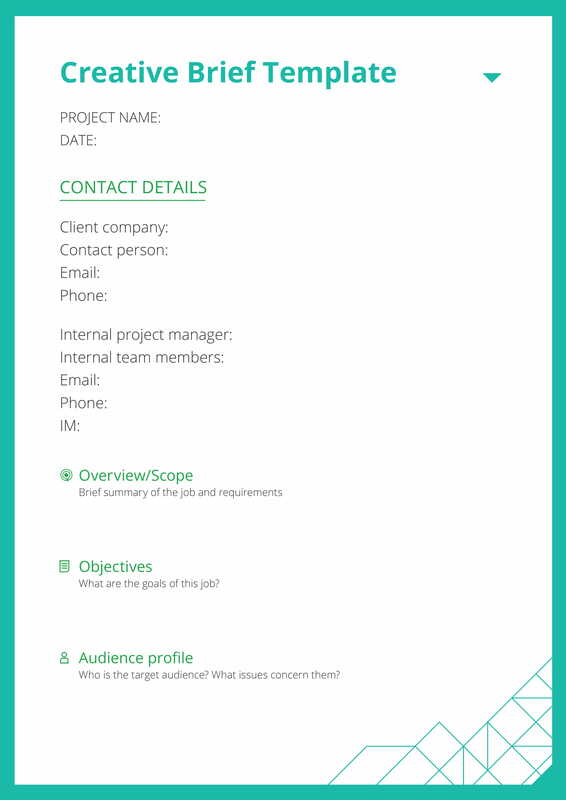 This is very useful since not all team members will have the opportunity to attend every client meeting, the creative brief will keep everyone updated on the changes made during such meetings. The creative brief will be like the baton in your relay race where relevant information are handed on the next contributor after a certain portion is done. It will help everyone know the status of the campaign in order to keep the focus of the people involved on their specific tasks. 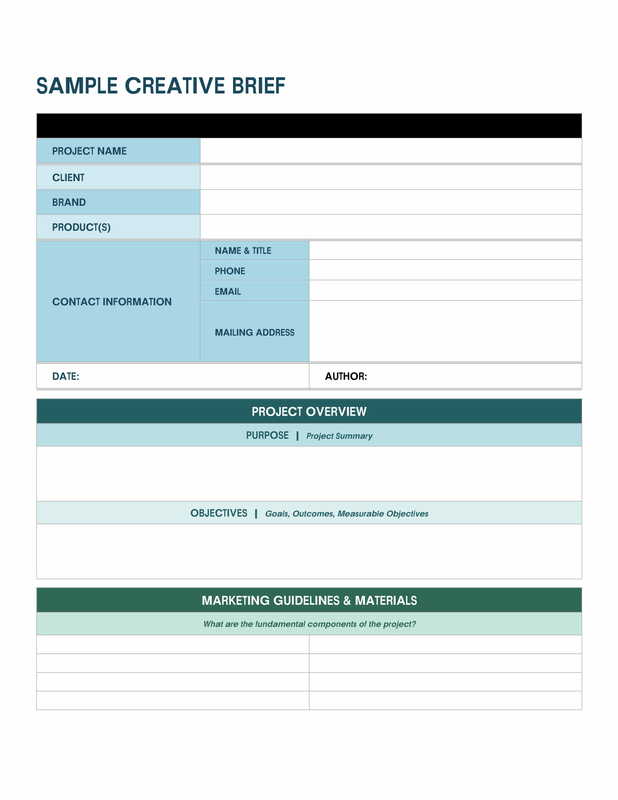 The main purpose why you make a creative brief is to arrange and organize all the necessary and relevant information you need for a marketing or advertising campaign in one document. An additional advantage to using a creative brief is that it gives you the chance to know and realize what you don’t know. Or maybe even realizing where your judgment and understanding can be stronger. With the opportunity of finding out what you don’t know of yet with regard to the project, it can be easily solved and given the right solution. This will also enable you to supplement your creative brief with additional information that will give you a more comprehensive understanding of the objective your client has in mind as well as determine how you can help out with achieving the same objective. Just because the document compiles all the relevant information about the project, it does not necessarily mean that it is a database of some sort. It is more than just a compilation of useful information, it is also a way to capture the tone the client wants to embody as well as the specific messaging it wants to convey to its prospect customers. It goes the extra mile of just quoting the products and/or services of the client, it also accounts the context and objective that is suitable for the overall goal of the client. Simply put, it should be and it is in fact more than just a collection of facts and other details, it is also a document containing the vision of the project. The vision should describe the wants, needs, and requirements of the client in order to clearly inform the stakeholders from start to finish. 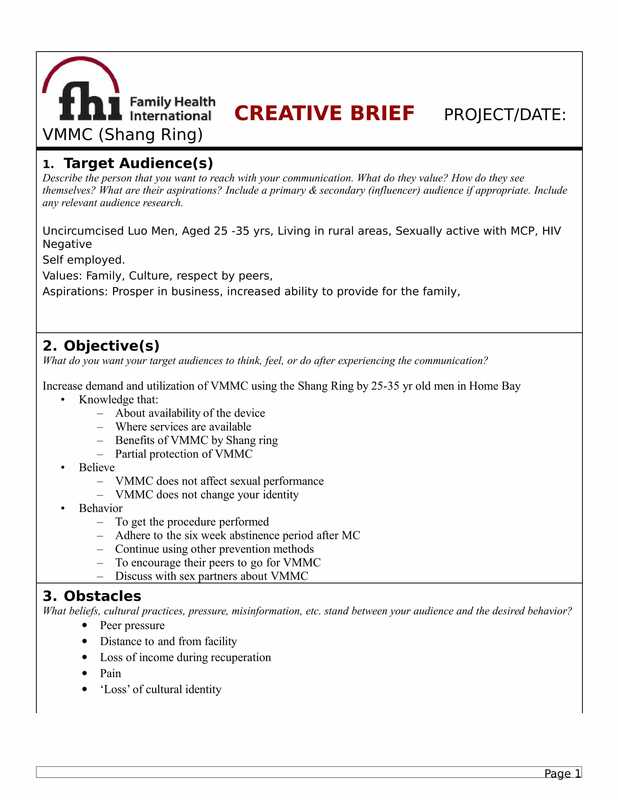 Since you have already established the vision for the creative brief along with the relevant information to pursue the said vision, you now have to proceed to addressing the responsibility of conveying the right message of the campaign. The messaging of your campaign will help you make and achieve the impact you plan to achieve. With the help of the information you have, which will be your starting point and the established end point or your vision, stakeholders can review, gain an insight, and decide on which possible routes to follow to get to the end point. This can be easily determined if there is a strong link between the product, the brand, and the style. These are the three factors that can help shine a light on which path is the best to take in order to get to the desired end point. While it is what you and your team intend to do and what clients expect from all of you, the energy and passion you can have for a certain campaign can ebb and flow. After all, you are all just humans who get tired from rigorous work and pressure; this is where a creative brief can come in handy and can help get all of you get right back on track. A creative brief, when done well, can be an additional source of inspiration that can help the creative juices flowing. 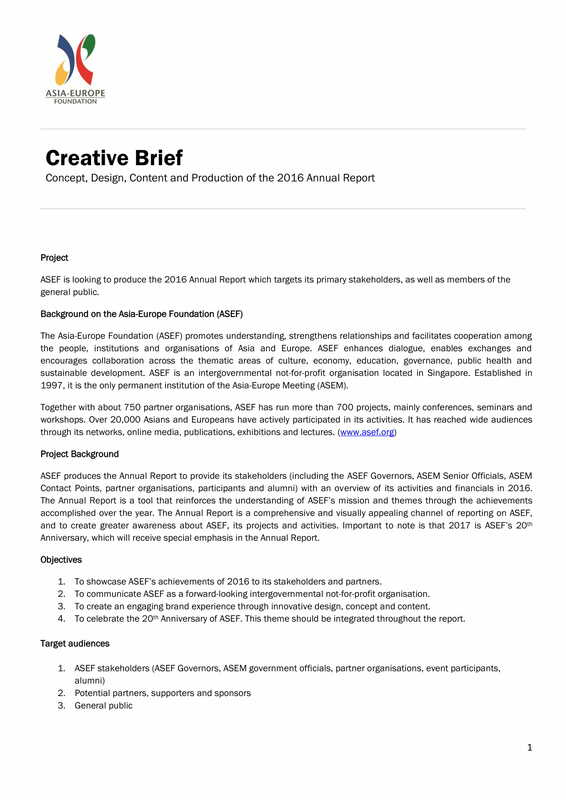 Even after the project is implemented, the creative brief still holds its original value. Although it is not needed just as much as it was during the planning stage of the project, it can still be useful when working on similar projects and/or campaigns, or working with similar clients. 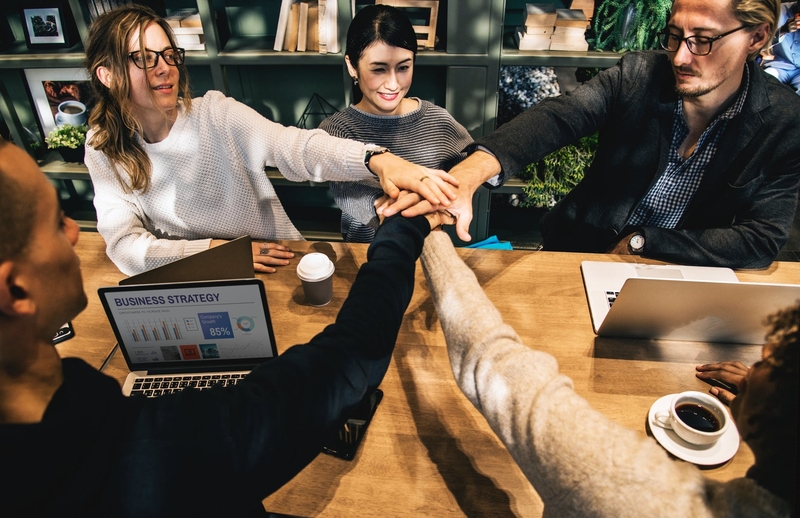 It can be easily reviewed in order to remind you and your team of what was right before and to gain an insight on what will be needed to endure a similar success on anew project or campaign. The company background should briefly state who the company is. It should provide relevant information in order to get to know the company and what it stands for. A mission statement or the values they stand for a best examples on what could be written in the company background. This part explains why they are in business, what problems they are trying to solve for their clients, and so on. 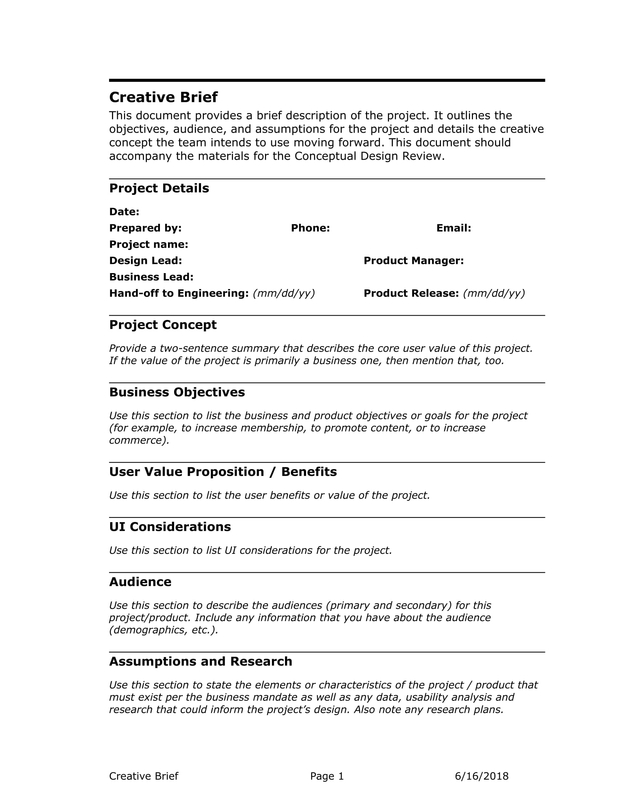 This section pertains to the point person/s of the project. The details regarding these people should be provided on this section such as their name and contact information. This will help all the people involved in the project know who to turn to when they have questions, clarifications, and suggestions. 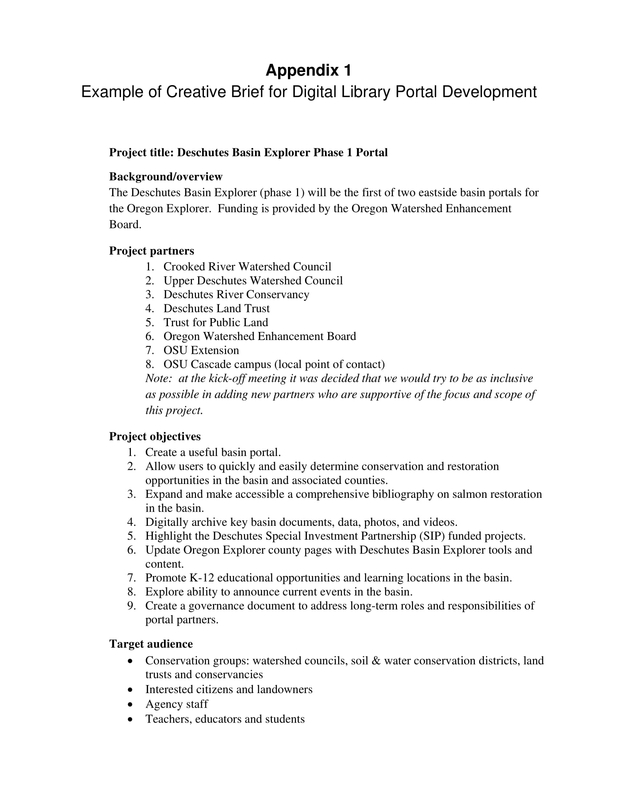 This section should describe what the project is, what it entails, and why it is being done. It should be specified on what you are trying to achieve with this project and how are you going to achieve it. The more detailed this part is, the less you can be surprised on what might happen during the course of the project. 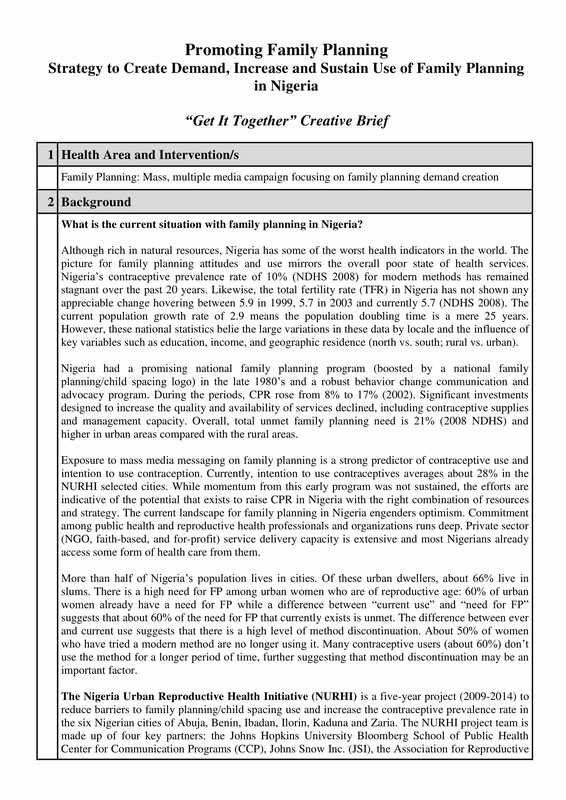 However, this should be done briefly but comprehensively since this section is basically just a summary and/or a description of what the project is. What is the purpose of the project? You need to be able to identify and determine what you want to achieve with the project in order to have a strong sense of direction. It is also a great time for you to find out if you want to achieve too many things in one project that will cause the project to be ineffective. This section should be narrowed down to the most specific goals and objective you want to achieve. 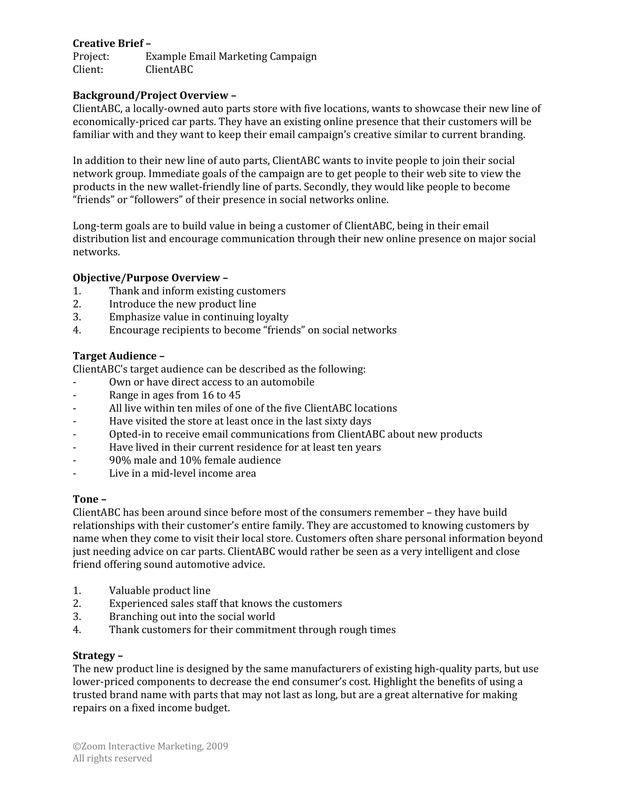 It should be clearly identified on the creative brief who the target audience or demographic of your project is. 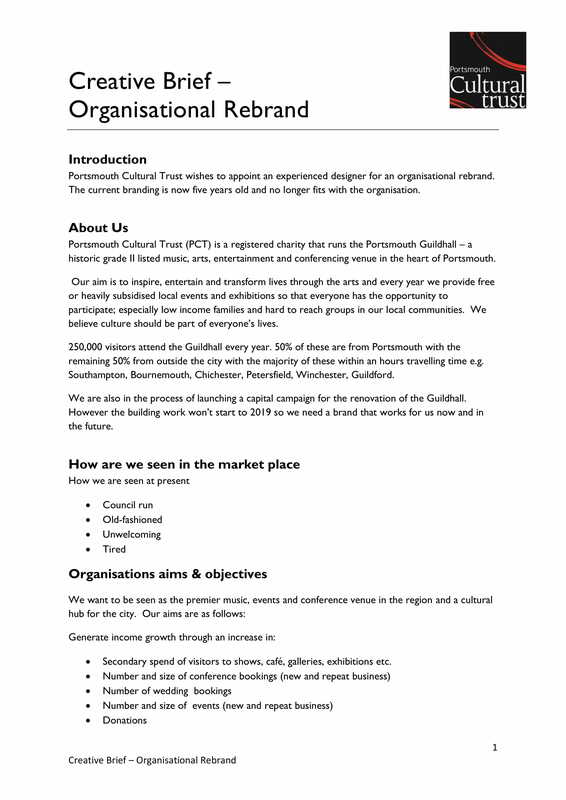 This is an important section on your brief since this will be the basis for your design and strategy. You have to make sure that the design and strategy of your project will appeal to your target audience. You have to determine what to deliver to your clients or what form will the campaign take. Will it be a one-page brochure or a batch of 10 banner ads or a logo for print, just for the Web or for both? You may want to provide background information regarding your competitors and any trades in the market that may impact your business. You have to provide an overview of your similarities and differences you share with your competitors. Details regarding your competitors will help you generate ideas that can make your business stand out from your competitors. 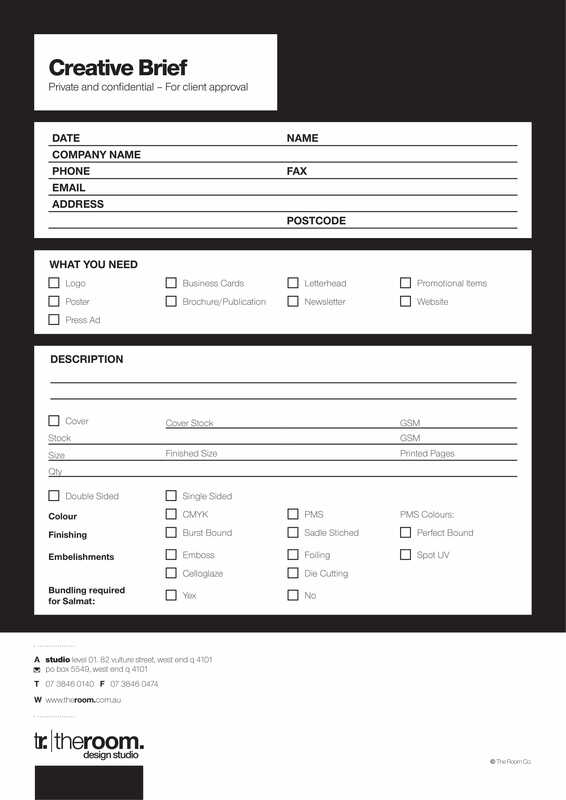 If you have already slowly established a name for your band in the market, the style and tone you choose for your brief should be consistent with the brand and it should also fit well together with what the project is trying to achieve and what actions you want your customers to take. You have to include your strategic positioning and address the key messages to help inform the messaging and ensure that it aligns with your objectives. During the initial meetings with the designer, you have to make sure you discuss about the project timeline and agree on it. If you have already agreed on it, you have to include it in the creative brief. This will provide a clear deadline on the project so you can make sure everything is done according to what have been planned and scheduled. You have to include the budget that has been set for the project in the brief and discuss it with the designer. If the designs and plans that the designer has for the project exceeds the budget, it is best to have another discussion in order to establish a more realistic set of expectations, deliverable, and project costs before getting started. 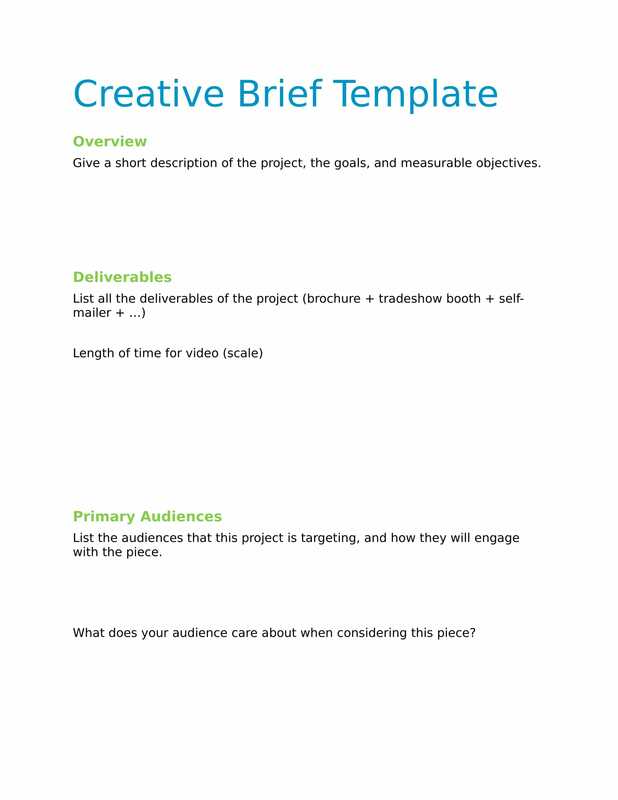 Start your creative brief outline by giving a description of your project and deliverables. The description should briefly include what the project entails and what is its purpose, and the deliverables should be specific. Next is writing your overview. The overview should include relevant information that your team will need to craft the creative elements of your campaign. 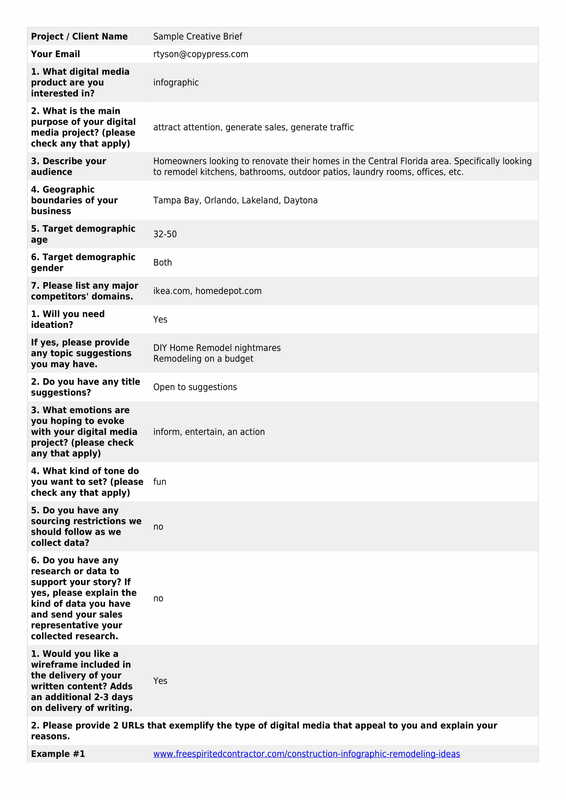 You can also add information regarding who is responsible for the final sign-off. Afterward, you have to establish your objectives. You have to clearly define the goals that you all need to accomplish. This will help you and your team work for the same goal and end result. Determine your target audience. 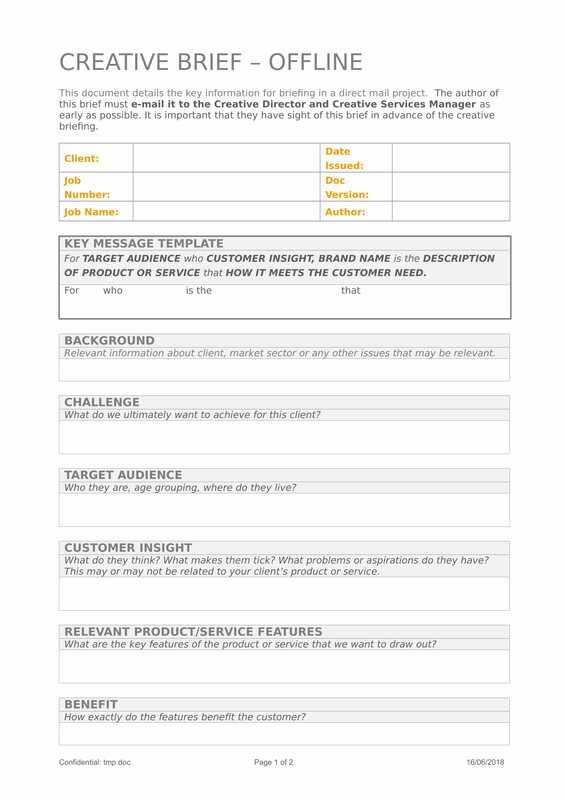 In order to determine you audience, you and your team should be able to address what problems you need to solve. 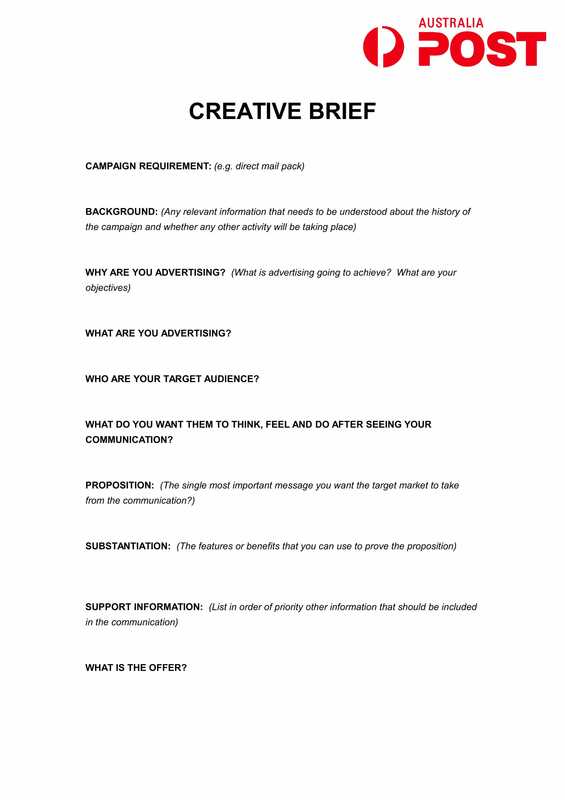 Finding out who your audience is will be vital in providing direction on how to format and design the campaign. Define the message. You need to be able to clearly define the message you want to spread. The brief should be able to answer these three following questions: What problem does the product solve? What’s the angle for this campaign? Which words will help us get that message across? Provide design direction. The design for your campaign should be clearly stated in your brief so that your designers have a clear picture on what it will look like when its finished. Your copywriters should also understand the design-side of your campaign so that they can provide direction for the designers as well. Define project tone. Your tone should be consistent throughout the entire brief since it expresses your actual message. Conduct competitive analysis. Make a list of your competitors and look into if they are doing anything closely similar to the campaign your team is creating. If they are, look for what’s resonating with their audience. You then have to find out how you can be different from them through your creative efforts. 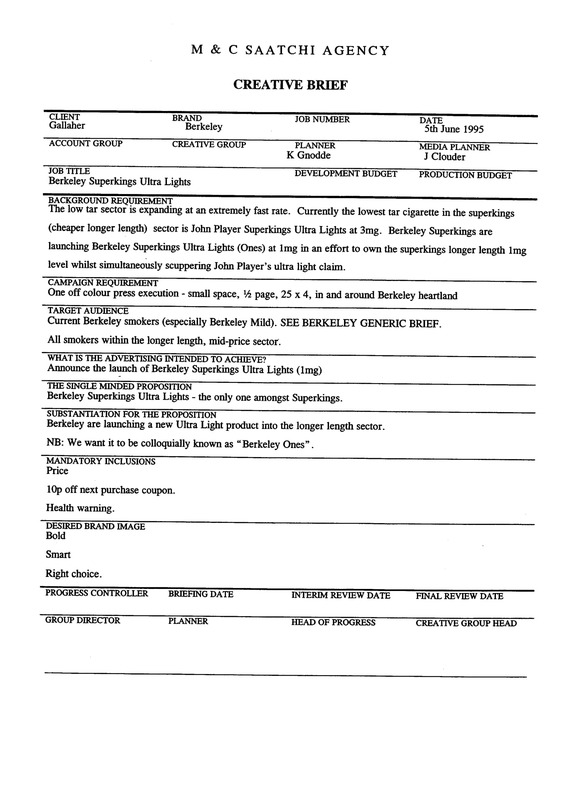 Outline creative and technical requirements. 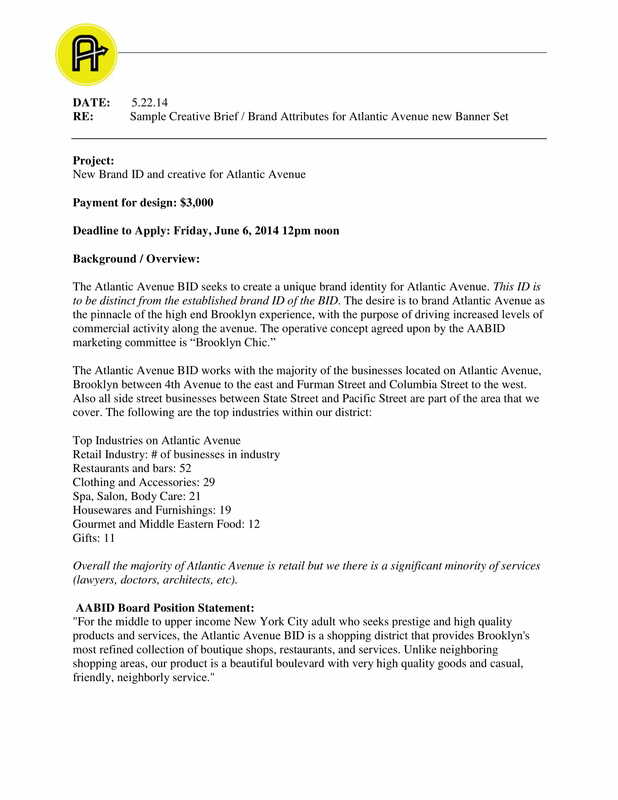 You have to list out all the image requirements, copy requirements, and technical requirements that your team needs before you can send in your brief to the advertising agency. Create a project timeline. 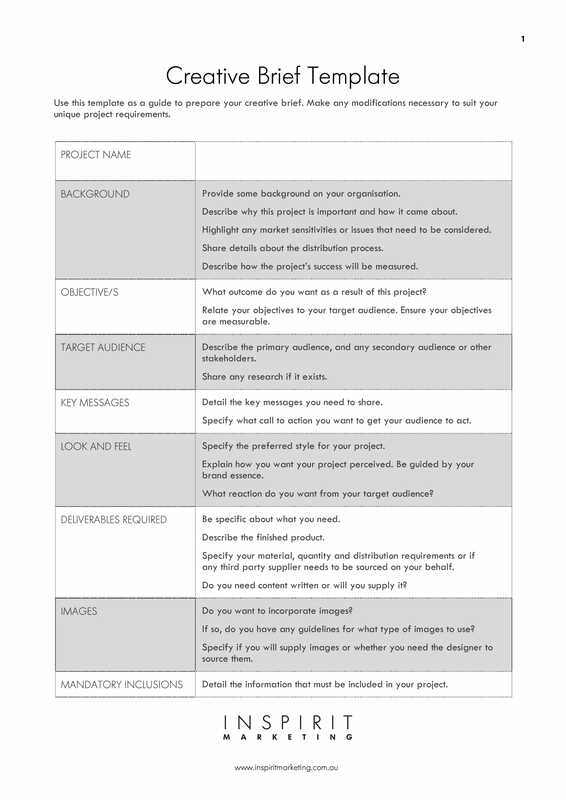 Your team needs to know how quickly they need to create and proof their parts of the campaign. You also need to provide initial due dates that includes what part of the campaign is due and when the specific date is. Finalize total costs and budget. 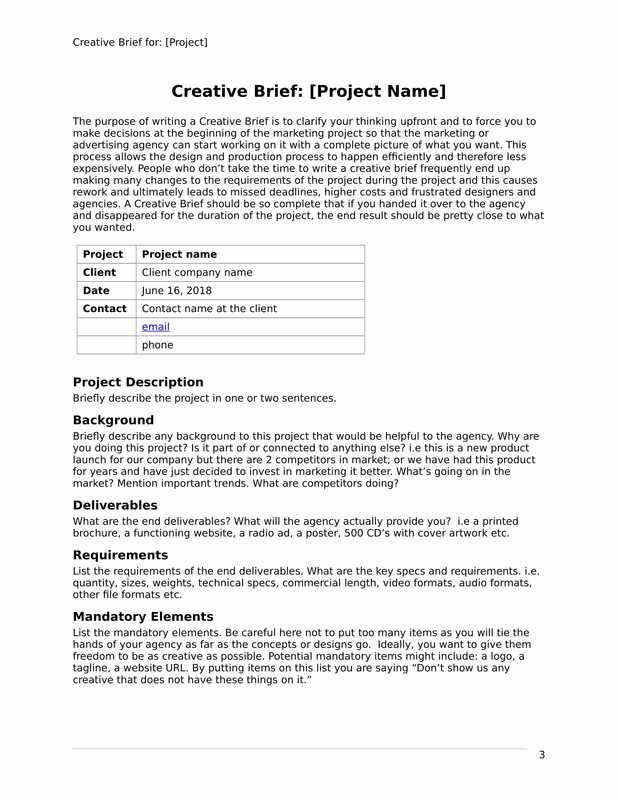 You should include your budget and the estimated cost of the services your team is providing in your creative brief. Avoid spending too much time deciding on what font and format you want to use. It can be tempting to change these aspects, most especially on what font style to use. However, during the first stages or drafting the brief should be dedicated on building a strong content. Also, besides the fact that these are only superficial aspects of your brief, these cannot possibly help you improve your content or message. Although it can be visually pleasing, these aspects can be decided on the last stages of finalization. Avoid changing these aspects just for the sake of changing; focus on the main goal, which is to establish a goal and a message. A mentor, a former colleague, a friend, or anyone you trust within the industry are the best persons to ask for advice. 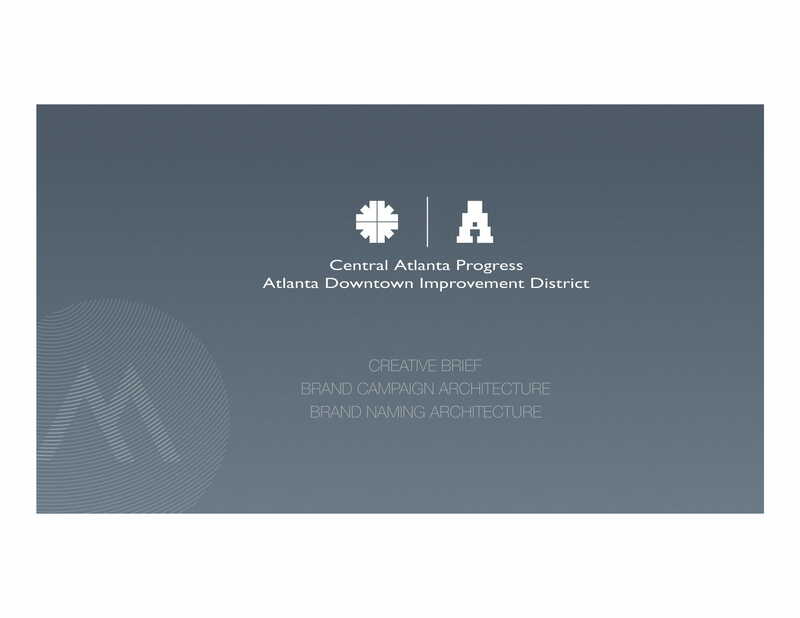 You can ask them about the best creative brief they have had the chance to read, what they found best and worse on the previous creative briefs, and if they can take a look at your recent brief. Those observations, suggestions, and questions may be disheartening sometimes, but it can always help you improve and build the content you are slowly establishing. After all, you will need other people’s approval not only because it is necessary during the process, but more so because it can help strengthen the message and improve the overall content of your brief. 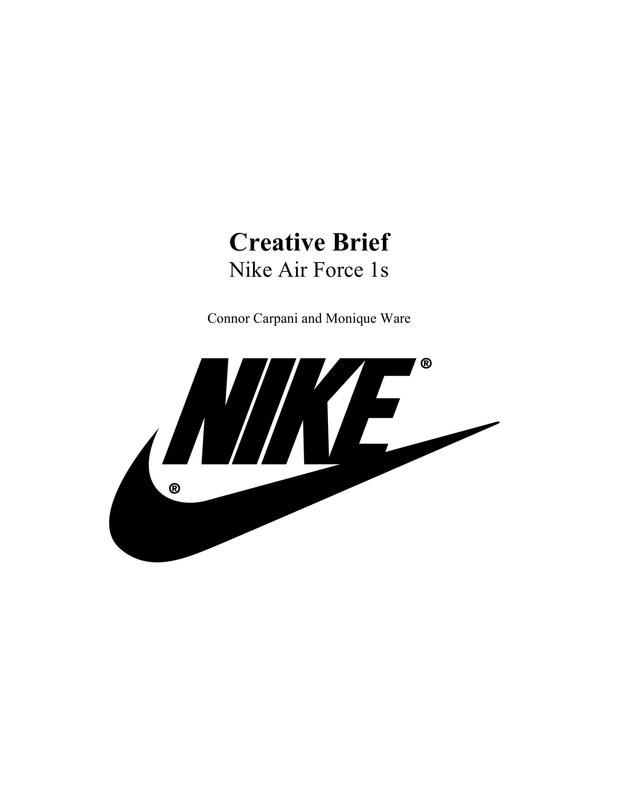 A key term to remember when making a creative brief is the word brief. As much as it needs creativity, it also needs to be brief. Make the brief as short as possible but not any shorter. Your focus during the process of drafting your creative brief should be making the brief actually brief, concise, and tight. You have to be specific with your audience. Is the final output of your brief intended for “everyone,” if so, does it really have to be? You have to keep in mind the audience and what they want to hear. Of course some of your audience already have some idea on things, therefore, you have to either prove their ideas and thoughts right or wrong. 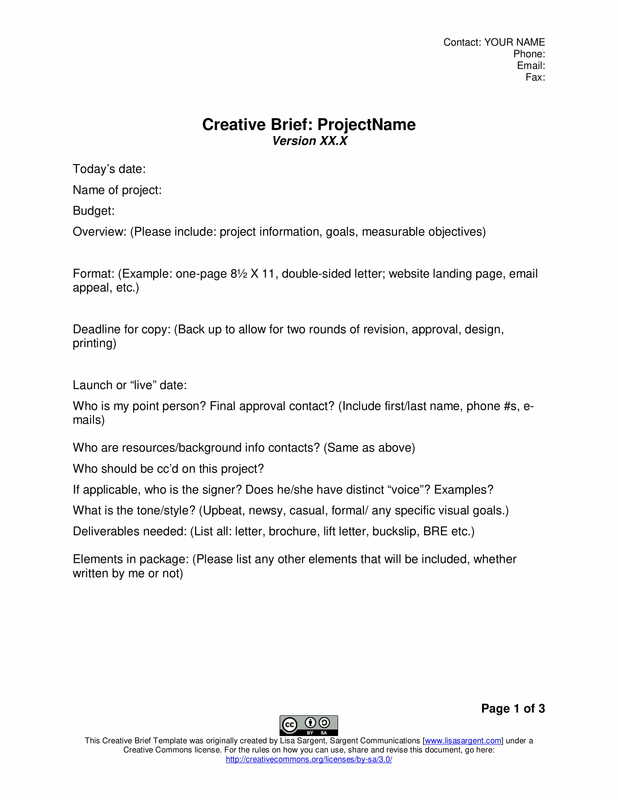 The timeline and schedule for the planning, designing, and implementation of the creative brief should be given much thought. You have to keep in mind that human beings will be responsible for the creation of the final output with which your brief describes. And just like you, they have the tendency to get sick, go on vacations, and can have either good and bad days. If you want to make something as unique as possible or you want something closely similar to a previous campaign, it will take some time to finish. Therefore, you have to put yourself into the advertising agency’s shoe and consider the right schedule for the brief. 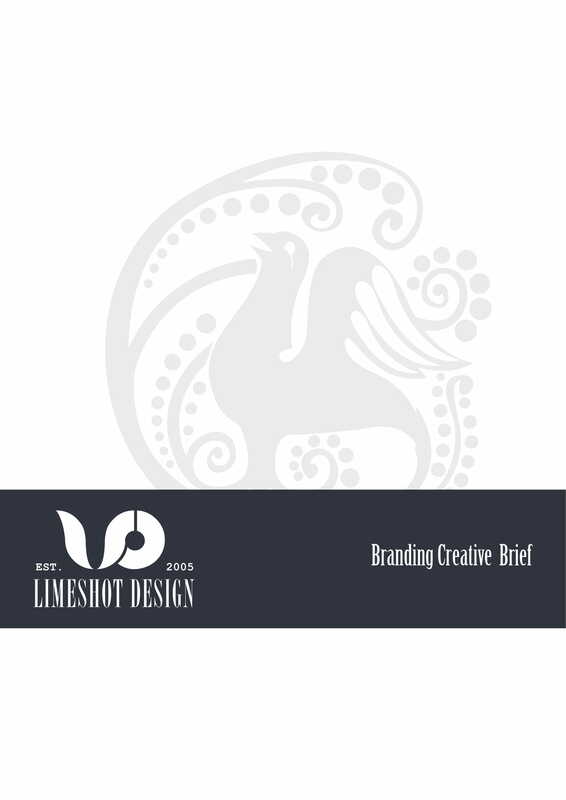 Although being open-minded and accommodating of all the trends, it can cloud the whole purpose of the creative brief. If everything is open-minded and non-committal in your brief, how useful can it possibly be? You have to remember that your creative brief will serve as a map or a blueprint for your campaign, therefore, it must have everything the agency will need to be pointed into the direction you want the campaign to take. You may think holding yourself back can make the brief less significant, but it can help you make a brief that is specific to what you want and can help you get your point across easier. Although you want your creative brief to be as perfect as it can be, it does little to help spread and raise awareness for the product or to just start conversations and drive conversion. You have to remember that your creative brief is, at best, just a starting point for your campaign. You have to make sure you start with your best foot forward and then figure out the rest as you go. At the end of the day, the ultimate goal is to get something useful done. 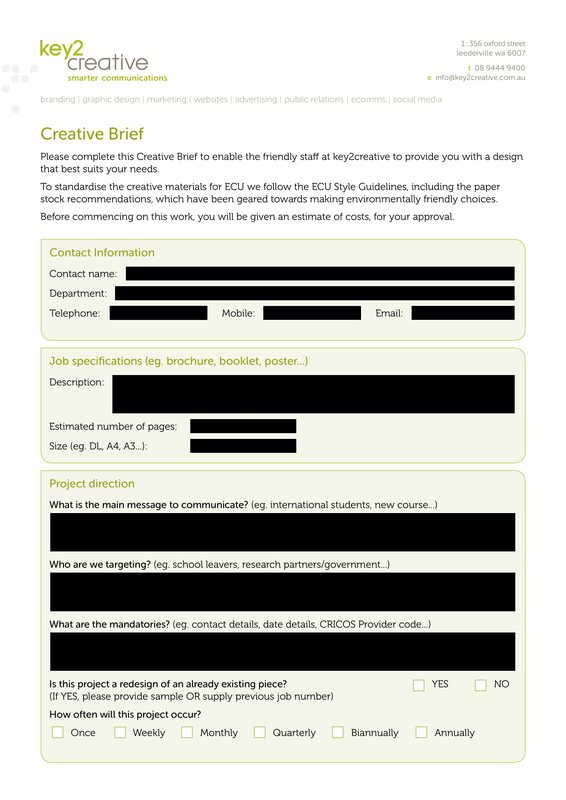 A creative brief is a useful document used when planning for a marketing or advertising campaign. It contains all the pertinent information needed to make the campaign a success. It serves as a guide and gives direction to the whole team involved in the campaign. 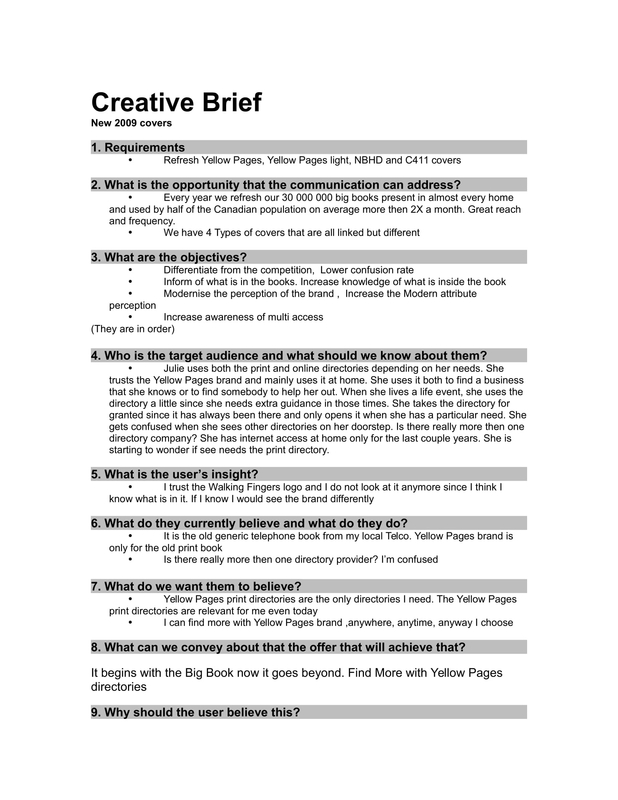 We hope that this guide has helped you understand the importance of a creative brief.